Whales in plural, because there are actually several species of whales toothed whales (Odontoceti) which include the great Orcas, also known as « killer whales », the Sperm Whale, the Beluga or Beaked Whales, or, from the « suborder » of Baleen Whales, also known as Whalebone Whales (Mysteceti), there is the Humpback, the Grey Whale, Right Whale, Sei Whale, as well as the gigantic Blue Whale. Are whales the biggest fish on earth ? No, because as astounding as this might seem, whales are mammals just like humans ! They have lungs, which means that they must surface regularly in order to breathe, and they nurse their young. In terms of size, we are really talking about giants here as the baby Blue Whale can reach up to 30 metres in length. As regards weight, with a heart weighing a ton and a tongue which may weigh up to 3 times as much, the Blue Whale easily tips in at over 100 tons ! By way of comparison, if we were able to place a Blue Whale on a gigantic scale, we would have to place 1000 humans on the other side in order to have a balanced scale ! Here is where the difference between the two suborders of whale comes into play as toothed whales (Odontoceti) have teeth and prey on fish, octopus, shellfish, cuttlefish and even other mammals, in the case of the Orca, including seals, sea-lions and even dolphins. What are the greatest threats facing whales ? During the last century, it was primarily unrestrained hunting by humans which was responsible for the effective decimation of their numbers. Since having been placed first on the list of protected species, and then on the list of endangered species, in addition to the passing of a hunting ban, the greatest threats facing whales today are actually pollution and global warming. 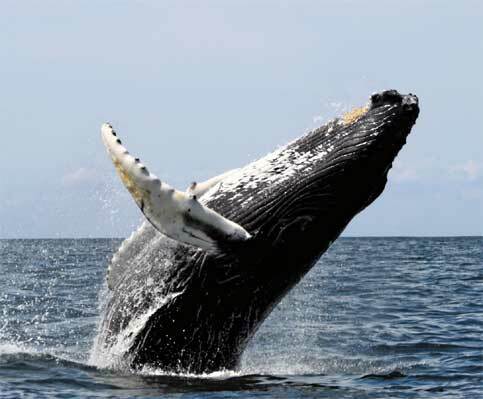 Nonetheless, several countries have continued to hunt whales despite the ban, such as Japan, under the rubric of « scientific research » and are responsible for the killing of several hundred whales each year. How can we save the whales ? As regards hunting, numerous organisations advocate the creation of expanded sanctuaries as extensions to those which already exist, in which all hunting is completely forbidden. These refuge zones would need to correspond to existing mating and migration zones in order to ensure the preservation of those whales which man has still not managed to mindlessly massacre. As regards the destruction of their natural habitats through pollution and global warming, only a global call to conscience and drastic action to reorganise the functioning of our societies will be able to slow, or even reverse, the dramatic and dismal developments we now witness. An amazing adaptation to the environment…. Forests are the lungs of our planet and sanctuaries for innumerable species. Their ongoing destruction is one of the greatest threats to our collective future.